Acer announced an elegant refresh of its Aspire Z 24 all-in-one PC and brand-new additions to the Aspire 7, Aspire 5, and Aspire 3 notebooks series. All powered by Windows 10, the Aspire series PCs cater to the needs of a wide range of users, spanning from the Aspire Z 24 all-in-one home PC for families, the multipurpose and student-friendly Aspire 3 notebook, the practical and functionality-driven Aspire 5 notebook for work and play, to the top-of-the-line Aspire 7 notebook for creators, designers and prosumers. 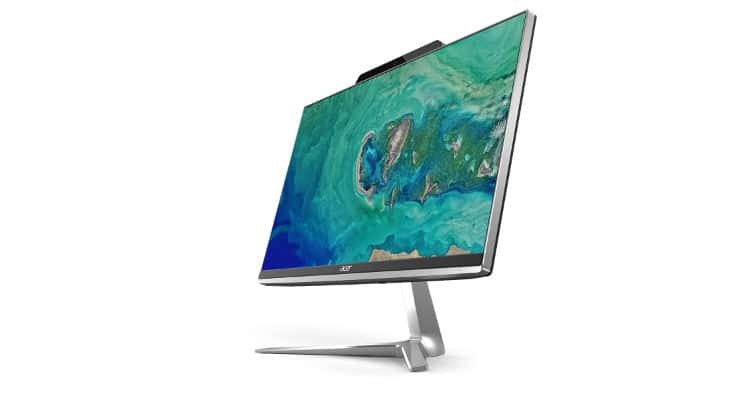 The Acer Aspire Z 24 is the all-in-one home PC for families and designed for connectivity and casual applications such as web browsing, social media, watching movies and casual gaming. Designed to blend in with living room décor, it’s extremely thin at just 11 mm (0.4 inches), with a beautifully shaped rear cover and an ultra-narrow bezel for maximum screen real-estate. It’s supported by a glossy V-shaped metal stand that gives it a sleek and timeless style. The Aspire Z 24 is equipped with a far-field microphone array made up of four digital microphones so customers can use their voice service of choice, such as Amazon Alexa or Cortana, to get weather reports, play music and manage everyday tasks from up to 4 meters away (13.12 ft). It also features Acer True Harmony and Dolby Audio Premium technology to deliver clear and crisp audio through dual front stereo speakers. The Aspire Z 24 is powered by the latest 8th Gen Intel Core i7+ desktop processors, with support for up to 32GB of Intel Optane memory and NVIDIA GeForce MX150 graphics, allowing it to power through complex tasks. The 23.8 inch Full HD IPS screen can be viewed comfortably at up to 178 degrees and menus can be navigated with ease using the 10-point touch display. Vibrant images with crisp, true-to-life colours come alive in Full HD 1080p resolution with wide-viewing angle capability, while Acer BlueLightShield and Flickerless technologies allow adjusting of the screen’s blue-light emission over extended periods of use. For users looking for a notebook with blistering performance, the Aspire 7 features up to an 8th Gen Intel Core i7-8705G processor that features Radeon RX Vega M GL graphics on the processor package encased in a slim 16.9 mm, all-metal body, weighing just 1.5 kg. The Aspire 5, ideal for bloggers, photographers and creators offer exceptional CPU and graphics performance with up to the latest 8th Gen Intel Core i7 processor with integrated Gigabit Wi-Fi for blazing fast connectivity and up to an NVIDIA GeForce MX150 GPU. The Acer Aspire 3 is a great value laptop built for everyday tasks at home, work or school, and includes a built-in optical disk drive3 drive and premium features for greater multimedia enjoyment. Aimed at prosumers, designers, content creators, or those who want a PC with more bite, the Acer Aspire 7 is not only beautifully designed with its full metal chassis with extra-light magnesium-lithium bottom cover and slim-line look but also packs a powerful punch. It has a 15.6-inch IPS2 display with a narrow bezel design with resolutions of up to Ultra HD (3840×2160), weighs 1.5 kg and measures 358 x 247.5 x 16.9 mm. At its heart lies a powerful 8th Gen Intel Core i7-8705G or i5-8305G processor with Radeon RX Vega M GL Graphics and 4 GB HMB2 Graphics Memory—all in a single processor package. It has up to 16 GB DDR4 memory, up to 512 GB of PCIe NVMe RAID 0 SSD storage, and a backlit keyboard to give users an added boost in productivity. Featuring a 4K display with Acer ColorBlast technology and Acer Color Intelligence, and speakers featuring Dolby Atmos sound and Acer TrueHarmony technology, the Aspire 7 speeds through rich content creation, video and photo editing, or viewing 4K content, while also offering an incredible, high-powered multimedia experience. Ideal for families and users who need a powerful, function-rich notebook for media consumption, the Acer Aspire 5 offers both looks and mobility. The hairline brushed pattern provides an exquisite, tactile finish accenting the premium aluminium cover so users can travel with ease and look great doing it. The narrow, 7.82 mm bezel design offers more real estate for amazing images and video. With a 15.6-inch Full HD IPS display and Acer Color Intelligence, crisp, true-to-life colours come alive. Users can adjust gamma and saturation in real-time, optimizing screen colour and brightness without clipping. It features up to the new 8th Gen Intel Core i7 processor with integrated Gigabit Wi-Fi for blazing fast connectivity, support for multiple personal assistants and voice services, and up to an NVIDIA GeForce MX150 GPU, delivering excellent performance. On top of computing performance, Acer TrueHarmony Audio brings sounds to life. The stylish 14-inch Full HD display Acer Aspire 3 comes in a variety of vivid colours and is perfect for delivering powerful multimedia experiences and entertainment. It’s flexible too, with upgradeable storage options and plenty of space for media, personal photos and documents. The Aspire 3 also packs in up to 8GB of DDR4 2666 MHz memory, a Precision Touchpad, Acer BluelightShield, an HDMI port, 3 USB ports and an optional built-in DVD drive. The Aspire Z 24 all-in-one PC, Aspire 7 and Aspire 5 notebooks powered by 8th Gen Intel Core processors will feature Amazon Alexa built-in, joining Acer’s growing portfolio of Alexa for PC devices. More owners of compatible notebooks and desktops can get more done by asking Alexa to check their calendar, create lists and answer questions; be entertained by asking Alexa to play their favorite music, podcasts or audiobooks; manage smart home devices including lights, thermostats and home appliances; and access tens of thousands of skills built by third-party developers.